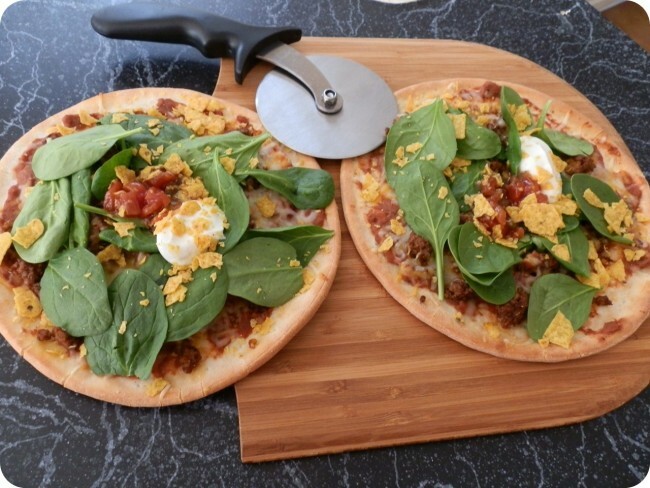 Gluten Free Taco Pizza ~ Yum! Testing out a Gluten Free Taco Pizza today. We are not a total gluten free family. Mostly, because I have no will power. Secondly, because do gluten-free foods really taste as good? 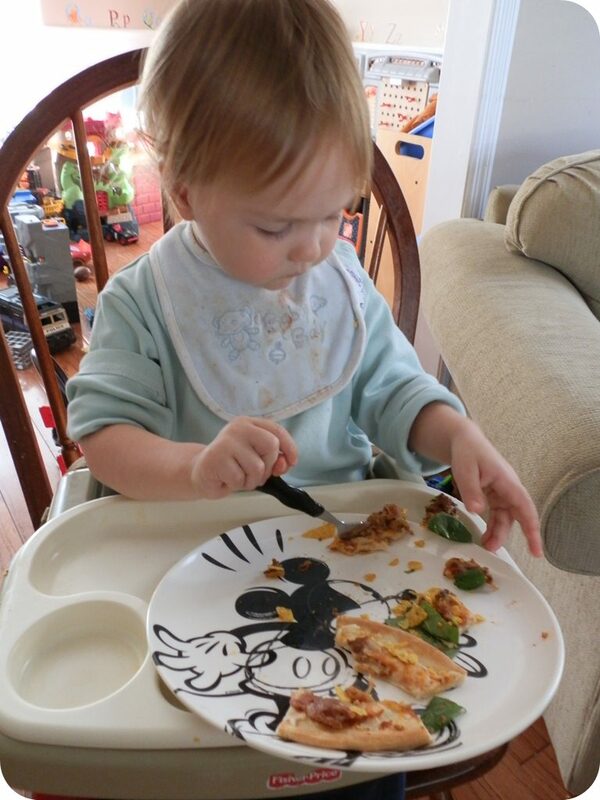 We know they are healthier and I do TRY to make gluten-free meals a couple of times a week. Hubby wished I would try a little harder in this department and so I wanted to make one of our favorites – pizza. Udi’s Gluten Free Foods helped motivate me this week. They are holding a Look Again, It’s Gluten Free Recipe Contest. The grand prize is a trip to California to attend a gluten free cooking class at Le Cordon Bleu. Another ten finalists will win a shopping bag and $25 worth of Udi’s coupons. Fun! What shall I create? Hmmmm…one thing that I have missed, now living in the south and I can’t find, is taco pizza. But that is not gluten free I can hear you saying. Well, it is….because I am making it with Udi’s Gluten Free Pizza Crusts! You will find them in your freezer section. I have never bought these pizza crusts (or any Udi’s product!) before and I did not know what to expect. I was preparing myself for a meal that could never be as good as ‘the real thing’. The dough is bought ready-to-go. All I needed to do was top them! Easy! I created a sauce that combined refried beans and pizza sauce. I used Trader Joe brands. I next topped with leftover seasoned taco meat from a previous dinner this week. Otherwise I would have made a batch and had tacos later this week! See I’m prepping. ha! Add cheese of course! I usually use the Mexican blend shredded cheese for this. Dropped them in the oven for only seven minutes. They came out perfect. The cheese was melted and the crust was crispy enough. I topped with spinach, a dollop of sour cream, salsa, and crushed chips. oh my! It was soooo good! I called Hubby at work and told him that I just made the best taco pizza, gluten free style. I was so proud! The crust was surprisingly tasty. Like a crunchy flatbread. Baby and I had a terrific lunch! 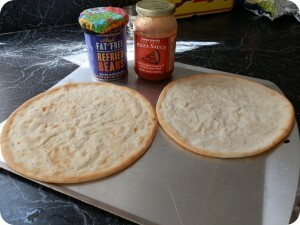 1 package of Udi’s frozen pizza crust – which is 2 single pizzas. Mix these two ingredients together in a bowl and spread as your bottom layer for your pizza. 1/2 c seasoned taco meat ~ I used leftover made with organic, grass-fed beef. Ground turkey or chicken would be wonderful too. 1/2 – 1 c of shredded cheese according to your taste. Put in preheated oven at 375 degrees for 7 minutes. Cook a pizza stone for best results. Top with spinach, salsa, sour cream or whatever you desire. 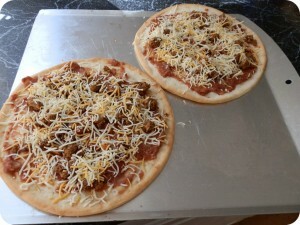 I have to admit that after creating this yummy pizza, I am going to be looking for more ways to prepare our meals. I love that I tried something new, that is not only one of my favorite meals, but is healthier than a pizza I would have normally created. I kept thinking of different varieties I could have made too – with black beans, more salad toppings. 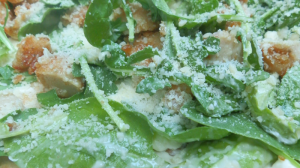 Check out my Chicken Caesar Salad Pizza recipe – this crust will go great with it! 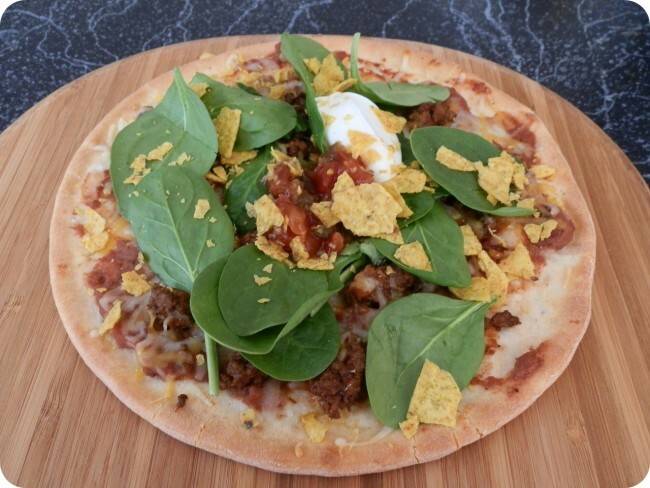 Would you love to create your own Gluten Free Taco Pizza? This is a sponsored conversation, Gluten Free Taco Pizza, is written by me on behalf of Udi’s Gluten Free. The opinions and text are all mine. Links may be affiliate.